There’s no relief in sight, either, because the next direct-to-video full-length animated feature in the Barbie franchise will be Barbie in the Secret Garden—which apparently features a princess, a fairy, AND a mermaid. If there’s a series that’s grown more tired than the Barbie movies, I can’t think of it. There isn’t an original idea to be found in this most recent installment—yet little girls will love it, while girls age 9 to 12 will still watch despite bemoaning how repetitive the series has become. For anyone else, this “original” movie apparently draws way too much from Disney’s The Little Mermaid, DreamWorks’ Shark Tale, and every Barbie movie that’s preceded it. 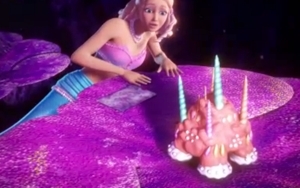 Kelly Sheridan returns to give voice to Barbie, or rather, Barbie as Lumina, a mermaid princess who was raised by an “aunt” that looks suspiciously like a flippered version of the children’s book heroine Strega Nona, complete with babushka and purse. Like Disney’s Ariel, Lumina has a love of pretty things, especially pearls—which she can command with a flutter of fingers, conjuring up beaded hair-dos and even (when necessary) pearl restraints. 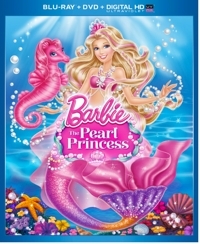 But Mattel-Universal has gone to the well way to many times for a mermaid-themed Barbie movie, and The Pearl Princess feels trapped at the bottom, mired in repetition and sameness. The animation may be decent enough and the color palette dominated by the pinks and purples that appeal to the target audience, but it’s so overly familiar that The Pearl Princess can be an ordeal to watch for anyone besides little girls. In this rehash, we get a same-old, same-old situation involving a princess who’s taken from her royal parents and raised by an old woman (shades of Sleeping Beauty), and there’s a ball (shades of Cinderella) with a young heir to the throne that’s pushed by his father to become king. But mostly there’s an overriding feeling that we’ve seen it all before in a film like The Little Mermaid. The sea-creature henchmen are moray eels, just as in Disney’s film, and, like Ariel and Flounder, Lumina and her seahorse pal Kuda explore an undersea wreck (in this case a whale carcass/skeleton, rather than a sunken ship). By the time we get to a city that’s inhabited by sea creatures, it looks an awful lot like the sunken metropolis from Shark Tale—with a beauty parlor scene that even seems similar to the car wash segments from that DreamWorks film. Naturally there’s an ambitious underling who undermines the king—we’ve seen it countless times before in the Barbie series—and we get it here again with the character Caligo. But because his gestures are the same as previous characters like him and the overacting (both the voice and the animation) are also overly familiar, you experience a sense of “not again.” So Barbie: The Pearl Princess is most definitely not a movie for the entire family, unless all the children are young girls. Even then, unless they’re coming at it without ever having watched other Barbie or animated undersea adventures, it would take the best parents in the world to watch this with them. Relief is in sight, if Mattel-Universal would just recognize it. Included as a bonus feature on this combo pack is an episode of Life in the Dreamhouse, a Barbie series that features obviously doll-jointed characters and the kind of self-referential humor that we saw in the Toy Story movies. It’s far more entertaining for the whole family than the main feature. So why not make a full-length feature? Come on, Universal. Do it for the parents.